Be thankful that we have so many excellent comics in Previews! Don't be afraid! Boy, I don't like that cover. The fact that they're drawn as segmented toys kind of freaks me out, man! Love and Capes: Ever After #1 shows up on page 154, the first new issue of the series in a while. I like this series a lot, but even so, I'll probably wait for the trade. That's just the way it is! Over on page 156, there's a trade of Fish Police. FISH POLICE?!?!?!?!? Yes, Fish Police. I've never actually read it - the only knowledge I have of Fish Police is from the issues of Grendel that contained advertisements for it back in the day. But there it is! It's always cool to see old stuff get reprinted for a new audience. There's a nice hardcover trade of Starstruck on page 158. It's 50 bucks, but that's for 13 issues jam-packed with cool stuff. And it's Kaluta on art!!!! Steven Struble, who's the coloring assistant on Chew, does a webcomic called The L'il Depressed Boy, which is now getting printed on page 170. I've read a little of the webcomic and it's pretty good, so I might have to check out the print version. Okay, so you know the hype around the "Death of Spider-Man" that Marvel is promoting? Guess what - it's Ultimate Spider-Man who's "dying." So not only won't it stick, it's not even the "real" Spider-Man. Good job, Marvel! And so, let us leave the comfort of the Big Two (and the Semi-Big Three) behind and venture into the Back of the Book!!!! SLG has The Vesha Valentine Story: A Pin-Up Story Book on page 210. It's the story of a burlesque/movie star who works her way up through the Hollywood ranks in the 1950s. I don't know if it's any good, but Des Taylor is an interesting creator, and he does attractive women pretty well, so this is intriguing. So there I am, checking out Book Palace's new collection, Ron Embleton's Wulf the Briton: The Complete Adventures, which sounds kind of neat - action/adventure from the late 1950s, and who doesn't love Britons fighting Romans? Then I looked at the price tag: $232. I almost choked. Really? Two hundred thirty-two dollars? It's limited to 400 copies worldwide, which makes it a "collector's item," but why would they limit it to only 400 copies? I'm certainly not ponying up that much for it, even though it looks keen. Jesus. $232. Did anyone read Muppet Sherlock Holmes, which is getting a trade from Boom! on page 248? Because it sounds awesome. 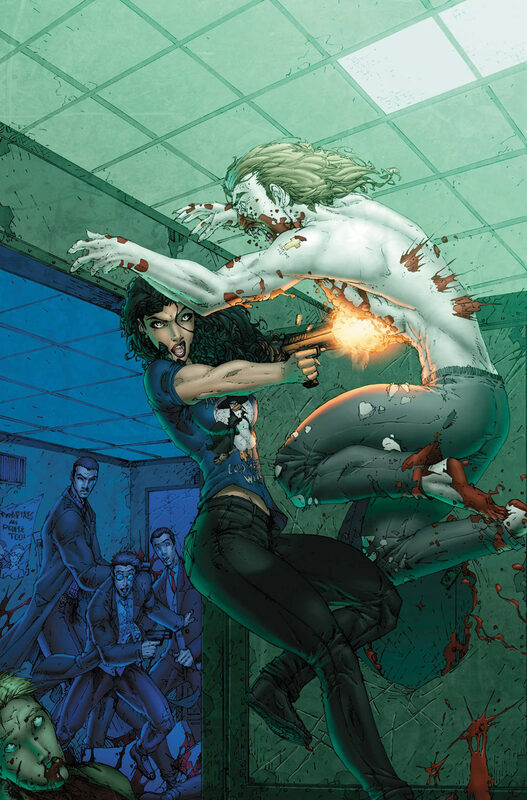 Over on page 254, Garth Ennis unleashes Jennifer Blood #1 from Dynamite Entertainment. It's the story of a suburban mom and wife who goes out at night and vigilantes things up. Yes, it sounds absolutely ridiculous, but I always have to give Garth Ennis a chance even though I haven't liked much of his stuff for a decade. Bullet to the Head gets a trade on page 264. The last issue hasn't shipped yet, but I'm fairly confident about recommending this trade if you've been waiting for it. Dr. Blink, Superhero Shrink gets a new printing on page 269 from Dork Storm Press. Dr. Blink is a fairly charming tale, so it's nice that it's back in print. Give it a look! Comic Book Comics #5 is resolicited on page 272 from Evil Twin Comics. I really hope it comes out this time! Fantagraphics is making a concerted effort to bring all of Jacques Tardi's works to the U.S., and they continue it on page 274 with The Arctic Marauder, which is described as a Jules Vernes-esque story about a dude in 1899 searching for a missing exploration ship in the Arctic. I haven't heard from Pedro in a while, so I hope he stops by and tells us if this is worth checking out, because it sounds pretty cool. Page 282 has Angeltown, the Vertigo comic from a few years ago by Gary Phillips and Shawn Martinbrough that, I guess, never got collected. Moonstone is publishing this, which is nice of them. It's, honestly, not that good, although Martinbrough's art is always a treat. You might like it, though! As much as I like Stumptown, the hardcover trade Oni has on page 288 is a bit much, because it's 30 bones. Man, that's stiff. I really hope a softcover is coming our way, because I will recommend that without reservations. Time Bomb hasn't finished yet, so I can't say with complete confidence that you should get the trade that Radical has on page 292, but two-thirds of the way through, it's a very entertaining comic, and the trade is only 15 bucks, which isn't bad. Well, I'd like to point out some other stuff, but we've reached the end of the comics section and I must stop there! As always, ask your retailer if he'll give you Previews for free - it will be beneficial to him in the long run! And don't be squeamish about flipping through the slab. Good stuff lurks within! Finally, in order to get my "I Dig Canada" badge, I should point out that I am a guest star on Chad Nevett and Tim Callahan's Splash Page podcast this week. Tim couldn't make it this week, so I offered to jump right in - usually on Friday night I watch "What Not To Wear" with my lovely wife, so I wasn't really missing anything. Head on over and check it out. If you've ever wondered what my voice sounds like (not as nasal as it usually does) and if you can ignore my laughter (I'm not sure why I laugh a lot; I don't think it's a nervous tic, because I do it when I'm not nervous, but who knows), give it a listen. Fine thoughts about four-color entertainment!